Enjoy reading the latest edition! Please help us write the coming edition! Stuart committed some changes to update the Select Airport dialog to use Canvas MapStructure Layers to display airport information, rather than the now deprecated map layers. The change should be largely transparent to end users - the only significant change is that your can display navigation symbols. This is all part of a long-term effort to provide the building blocks for a Garmin G1000 - these layers could be used for the airport display on the MFD, and could easily be combined with the APS layer to show a moving aircraft. 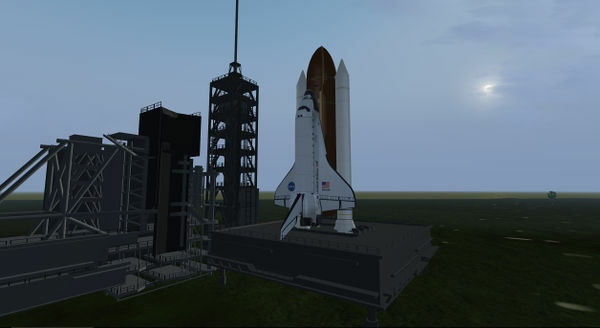 Some updates on the Space Shuttle Wiki, mainly some new screens up to date with the latest version. A lot of changes have been made by Thorsten and the Shuttle team concerning the Orbiter. Mission phases part has been reworked with annotated screens for tutorial, and more advanced Tutorial are available. Let's start our journey, Astronauts have already been seated in the Shuttle for almost two hours, preliminaries checks are done. Configuration of computers, checks of the pressurisation, and many other tests. We start on the pad, holding the timer at 9 mn before lift off. It is one of the most impressive aborts. To fly outbound leg at Mach 7 then invert the speed to come back at Mach 7 towards Florida. It gives vertigo considering how tight the margin is to meet all the guidance and navigation requirements to end up gliding back towards KSC. An iconic sight is one of the Aircrane flying low and slow over a raging wildfire dropping its load of retardant. Or hovering high above a massive tower assembly placing the final piece to the vertical puzzle. 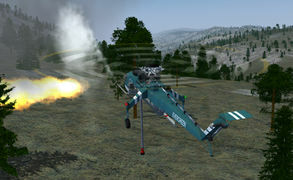 Fitted with a 2650 gallon water tank the Aircrane is capable of a computer controlled delivery of its payload. The engineer can choose from one of 8 presets coverage levels or deliver the entire payload in a 3 second salvo. The delivery rate is calculated and controlled by computer, taking airspeed into account for a more precise delivery. The ability to restrict the amount delivered from the tank to one of 4 preset volumes 25%, 50%, 75% and 100% is also available. Another feature of the tank is an inner holding tank giving the ability to mix a foam retardant into the water delivery system. Up to 300,000 gallons per hour of water, retardant or foam mixture can be delivered to the fire using this system. Another optional equipment package is the water cannon. It shoots a stream of water or foam mix in front of the aircraft at a rate of 300 gallons per minute. It has a small vertical pitch range of 15 degrees hydraulically controlled. 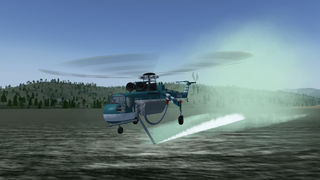 The helicopter itself controls the horizontal yaw of the stream. This provides the ability to deliver fire suppression far above the reach of conventional hook and ladder equipment. Filling of the tank is accomplished by one of two versatile methods. Either by using the hanging snorkel to suction water from any body of water, include a creek or slow flowing river, in as little as 45 seconds. 18 inches of water is all that is required for the snorkel to function. The Sea Snorkel is the other fill method. 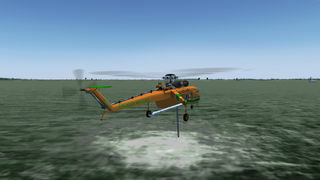 The hydraulic controlled boom is lowered as the Aircrane skims low over the water at around 35-45 kts. This method can fill the tank in as little as 40 seconds. You can find portions of this upgrade already available in FGAddon. 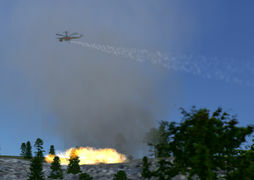 The ongoing work of creating the controls are available in the development repository at https://github.com/wlbragg/AirCrane. You can follow work and discussion on the forum. In the weekend of 4 and 5 November 2017, a team of FlightGear developers will present FlightGear to the public at the world's largest flightsimulator event. The so called FSweekend is held yearly in the Aviodrome aviation museum at Lelystad Airport (EHLE), the Netherlands. The team would love to welcome you in Lelystad! The FlightGear Wiki still needs help for translating it into various languages. If you are interested in making the FlightGear Wiki multilingual, you can start by looking at Help:Translate. Le wiki de FlightGear a toujours besoin d'aide pour être traduit en différentes langues. Si vous êtes intéressé par le rendre multilingue, commencez par lire Help:Traduire. Das FlightGear Wiki benötigt immer noch Hilfe bei der Übersetzung in verschiedene Sprachen. Wenn Du Interesse daran hast, das FlightGear Wiki mehrsprachig zu machen, dann fang mit dem Help:Übersetzen an. De FlightGear Wiki kan nog steed hulp gebruiken bij het vertalen van artikelen. Als je interesse hebt om de wiki meertalig te maken, raden we je aan om een kijkje te nemen bij Help:Vertalen. La wiki de FlightGear todavía necesita ayuda para traducirla a varios lenguajes. Si estás interesado en hacer la FlightGear wiki multilingüe, entonces comienza en Help:Traducir. 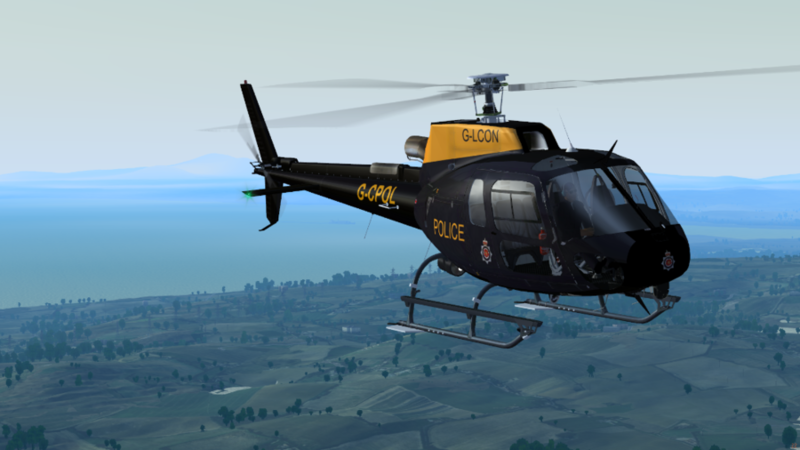 La wiki de FlightGear encara necessita ajuda per traduir-la a diverses llengües. Si esteu interessat en fer la wiki de FlightGear multilingüe, llavors comenceu a Help:Traduir. 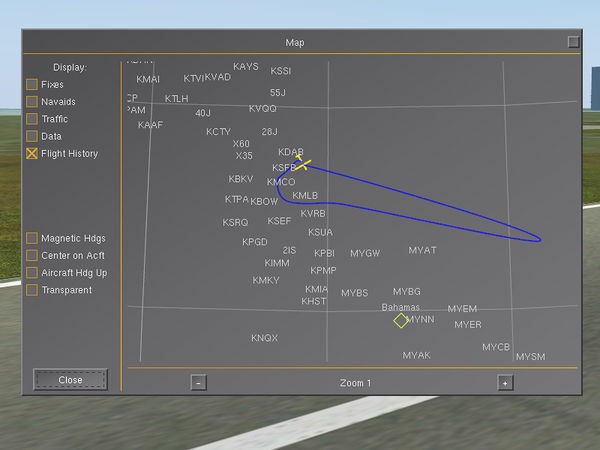 A wiki de FlightGear ainda necessita de ajuda para traduzi-la em vários idiomas. Se estás interessado em tornar a wiki de FlightGear multi-lingual, por favor começa em Help:Traduzir. If you want some graphic elements for your FlightGear-related site (such as a hangar or YouTube channel), please feel free to visit FlightGear logos for a repository of logos. And if you have some art skills, please don't hesitate to contribute with your own design creations. The FlightGear project always needs screenshots, which show features that were added since the last release. These should be of good quality, especially in content and technical image properties. It is therefore recommended to use the best viable filter settings (anti-aliasing, texture sharpening, etc.). More info at Howto:Make nice screenshots. If you want to participate in the screenshot contest of *November*, you can submit your candidate to this forum topic. Be sure to see the first post for participation rules. For purposes of convenience and organization, after all the entries have been submitted, a new forum topic will be started containing all shots in an easy-to-view layout. The voting will then take place there. Once the voting has finished, the best screenshot will be presented in the Newsletter edition of *November*. ↑ Stuart Buchanan (Oct 13th, 2017). 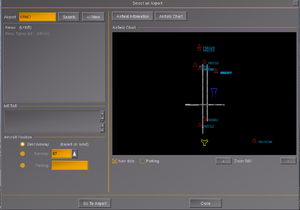 [Flightgear-devel] Updated Select Airport dialog . This page was last modified on 3 November 2017, at 07:16.